Pictured: Cleveland Public Theatre’s Brick City Theatre. Photo by Steve Wagner. Art is an essential part of my life. It enhances my well-being. You may be the kind of person who values access to community programs that offer music, dance or theatre performances, literary readings, or lectures on philosophy or history. Without art, there is no humanity. Without humanity, hope is compromised. I was introduced to the arts at a very early age. My mother, a gifted singer, played piano and sang to me in our living room to keep me occupied before I was old enough to go to school. She also acted in our local community theater for many years. I have fond memories of sitting in the back of that community theater, watching my mom in rehearsals. I continued that love of artistic expression into adulthood, and served on the board of directors for several small arts organizations. Today, I remain a dedicated arts patron. 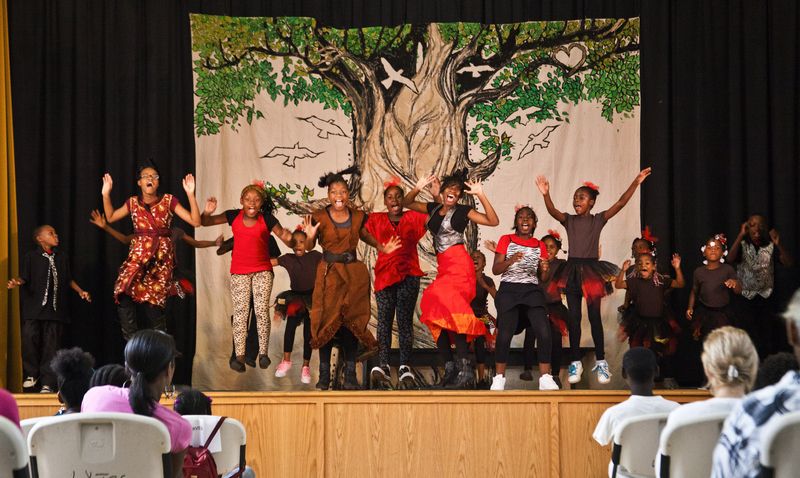 Every nonprofit arts organization relies on some form of public funding to bring its creative and brilliantly produced programs to the community. Currently, several important cultural institutions are being threatened: The National Endowment for the Arts (NEA) and the National Endowment for the Humanities (NEH). As independent agencies of the U. S. Federal government, the NEA and NEH were established through the National Foundation on the Arts and the Humanities Act of 1965, which was enacted by Congress. The NEA supports arts programming in the areas of accessibility, dance, international arts, media arts, musical theater and theater, visual arts, design, literature, museums, opera, arts education, folk and traditional arts, and music. The Corporation for Public Broadcasting (CPB), a nonprofit corporation created by Congress in the Public Broadcasting Act of 1967 is also under scrutiny. CPB provides funding assistance to more than 1,500 public radio and television stations across the country. Programs provide rich educational, historical, and entertainment content. Funding for these three essential organizations is less than $750 Million. To put things into perspective, proposed U.S. military spending is expected to increase by 10%, equivalent to a $54 Billion hike. That’s with a B, and that’s just the increase. Where would our American society be without the arts and humanities? The value that these three organizations provide to citizens is unparalleled. Millions of underprivileged children have benefited from after-school arts programs. Senior citizens on fixed incomes have tuned into interviews with thought leaders and listened to great performances. Families have enjoyed free community performances. Consider how your life (and the lives of your family, your children), has been enriched by programming in the arts and humanities. Now think about how the lives of future generations will be affected if these vital organizations disappear. Take a moment to join the fight to retain the NEA, the NEH and the CPB. It only takes a moment.